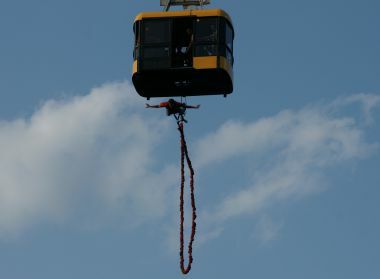 BUNGEE JUMPING we organize from 43m high areal cable car. 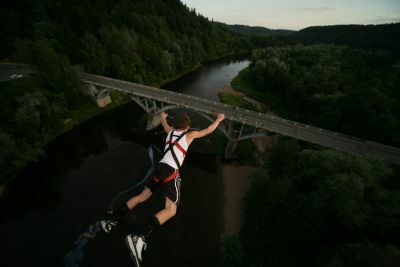 The beautiful landmark in National park over Gauja river makes this experience very special. Company operate every Thursday, Friday, Saturday and Sunday from 18:30 till the last customer. Season starts at April and continues through beginning of November. 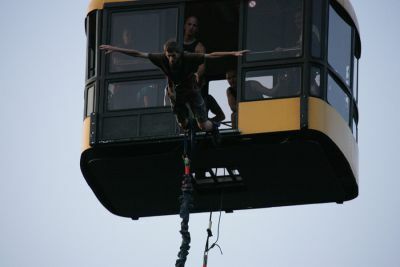 You have a possibility to capture your fear, your jump and your joy in a high-quality video. In winters organize jumps for groups of at least 10 jumpers. Prices: Thursdays – 20Ls (29 EUR), Friday, Saturday, Sunday 25Ls (35 EUR). For organized groups of 10 and more jumpers from Monday to Wednesday offer special price 17Ls (24 EUR). You have to sign up for the group jump at least one day before by calling.